Mac photo loss has never been a thing of the past. In the world of digitization, photos are a good medium to share memories. Mac users are inclined to do a lot of image editing and sharing. Mac has abundant image editing or processing features. You can also share your photos by transferring them over a network. Sometimes, you end up losing your important data while deleting files and folders in bulk on your Mac hard drive or camera card. In such cases, you can face unexpected photo loss, which may leave you emotionally bankrupt or taken aback. One of the major reasons for severe photo loss on Mac storage devices is accidental reformatting. These disasters occur when you attach the camera card to a different device (usually, a Mac machine or another camera) and try to view or edit the saved photos. The new device does not recognize your card and displays a message to reformat. Memory card corruption may occur if you improperly handle the card or perform an incomplete read or write. Some image formats are specific to digital cameras, called RAW format. An event of media corruption can also make your ‘RAW’ format pictures inaccessible. Your Mac hard drive or camera card does not lose the contents of the pictures deleted or moved to Trash. These photos can be recovered intact until the space occupied is overwritten with new data. Stellar Photo Recovery Mac is dedicated to retrieve all your deleted, lost, or inaccessible photos on Mac hard drives, USB drives, memory cards, iPods, digital cameras, etc. 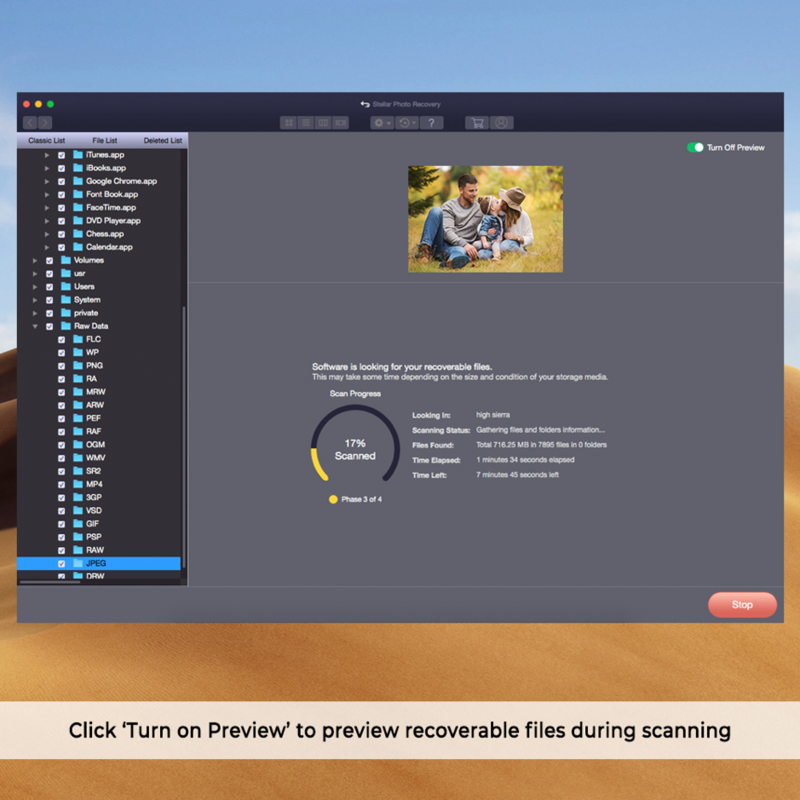 This competent photo recovery Mac tool provides you the ability to scan high-capacity drives (more than 4TB) and recover your digital photos keeping their original quality undisturbed. 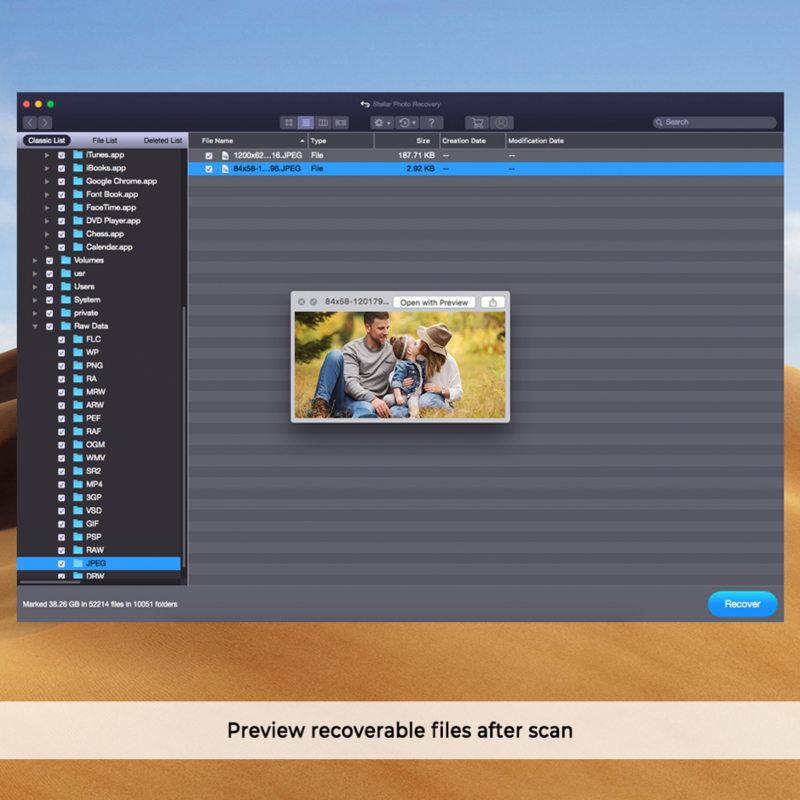 When you launch Stellar Photo Recovery, the main interface of the software is displayed as shown below. Select data from “What to recover” screen. The software starts scanning the selected drive and displays images and multimedia files under three categories .During this scan, the software provides a dynamic preview of images. You can also preview them after scanning by selecting the desired file from the left pane. Select the files you need to recover and click ‘Recover’ at the bottom. Provide a destination where you need to save the recovered images and media files. Once you specify the destination path, the software begins saving the recovered data to your system. The dialog box shows the status of the saving process.